This year, in the midst of putting together the most ambitious theatrical production we've ever undertaken, I decided we needed one more challenge. We have been running Keynote as our primary presentation platform for some time now (since long before I arrived) and I love Keynote--but not for this application. I have been planning a switch to ProPresenter, especially since v. 4 was announced. 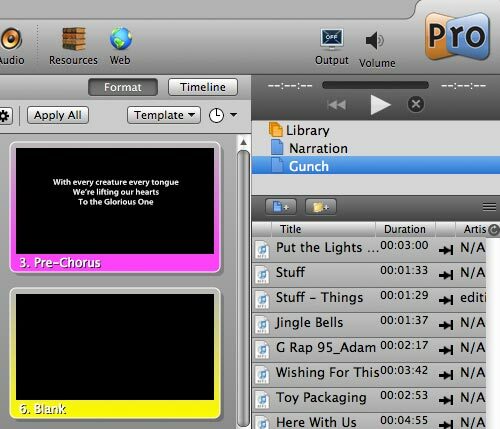 The Christmas Production seemed like a good time to try something new--so we ran the whole thing from ProPresenter 4 Beta. That's right, we ran it live, in beta form, with no backup. Crazy? Not really--it was a calculated risk. I've been working with the beta version for several months, and honestly had no real concerns about stability. Every version for the last month has been quite stable and crash-free, especially in simple playback mode. There was the occasional glitch when editing, but not in playback. So I felt good there. There was a concern about our presentation operator picking it up quickly, but again, Pro is o easy to learn and use I wasn't too worried about that, either. Plus she's pretty smart and enjoys learning new things, so I knew she'd be up to the task. She did wonderfully, even figuring out some things that I didn't know; so that was a win. We also had a fair amount of time to test it (and I could have bailed to Pro 3 during rehearsal week if I felt we needed to). However, from the first rehearsal on, it ran like clockwork. We played around with different ways to cue things and settled on the ones we liked the best. The shows were flawless from a video perspective. Keynote probably could have done it; but I think going with ProPresenter was the right call. Here are a few things that I really like about the new version. The audio bin is new to Pro4. You can load up the library with sound effects, songs, tracks, whatever; organize them into playlists and trigger them at will with a full playback bar. This was a huge help during rehearsal when we didn't have the band. I simply loaded the tracks for the songs into the library, and cued them at will. We could have added them to slides, but then we'd have had to keep changing the actual show presentation. This way, we could build the presentation for the show and still roll tracks. The Audio BinOne nice feature is the ability to set sounds as a track or sound effect. When it's a track, you can start, stop, pause and rewind to beginning, just like a regular playback device. In sound effect mode, the sound plays. That's it. You can clear it with F5, but once you trigger it, it goes. This is great if you need to layer up multiple sound effects at once. We considered playing our sound effects this way, but ended up tying them to slides for simplicity sake. Still, it's nice to have it there. This one we actually learned about too late. We needed to put some text on a background at an angle. Since I didn't know you could rotate text boxes in Pro, we set it up in Keynote and exported as JPGs. That worked, except, in the version we had last weekend, there was an issue with dissolving between files with the same background--there was a significant dip in brightness. So that option was out. (That has since been fixed, and very well I might ad, in the latest build) So I discovered that we could take the text into Photoshop, export it as text on a clear background and bring it right into Pro with full alpha support. It was a bit tedious, but worked wonderfully. I would never do text this way again (since we now know how to rotate it...), but if we ever need to do a graphic overlay, bug or other effect, it's great to have full Photoshop layer support. And, in case you were wondering, rotating text is simple. Create your text box, then click on the Object Controls tab. Spin the knob and you're good to go. Here's one we didn't use for the show, but I learned about it during rehearsal. 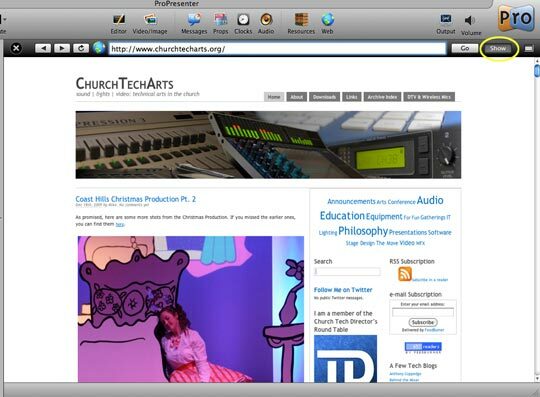 How many times have you needed to display a web page during a service or special event? It's always a hassle, and usually involves closing or minimizing your presentation app, dragging a browser over to the playback window (which never goes smoothly) or something like that. Wouldn't it be nice to load a page in your presentation software and click "Show"? Well now you can. Using the built-in web viewer, you can now route any web page straight to the projector. With full interactivity. Genius. There's your "easy" button...There is a lot more to love here. Templates, the new file-based architecture, the presenter display, timers, props, messages, the ability to add layers and objects to slides easily, sync-able libraries, the list goes on. On top of that, one of the things that I've always respected about the team at Renewed Vision is that they listen and respond to customer requests. If you haven't tried the beta yet, it's time to do so. I know I sound like a bit of a ProPresenter fanboy, but I'm really impressed with this product. Once we make the complete switch, it will vastly simplify our workflow. Check it out at Renewed Vision.